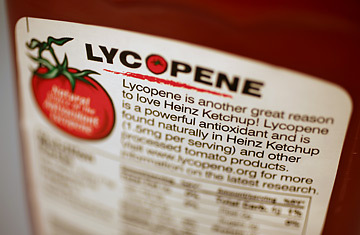 Explanation of lycopene on a ketchup bottle. Diet And Cancer: Diet And Cancer: Can Food Fend Off Tumors? Nothing sounds  or tastes  better than the idea of eating your way out of cancer. So it's disappointing news indeed that the Food and Drug Administration has deemed that tomatoes, so rich in antioxidants and other good things such as beta carotene, may not protect against many types of cancer after all, as some earlier studies had found. The agency responded Tuesday to applications from two tomato-product groups, including H.J. Heinz Co., which planned to tout the anticancer benefits of tomatoes on their product labels. After a review of dozens of studies, however, the FDA found that there was "very limited evidence" to support any association between tomato consumption and reduced risks of prostate, gastric and pancreatic cancers. As for the believed cancer-fighting effects of lycopene, the key anti-cancer fighting ingredient in tomatoes, the FDA was even more discouraging, saying there was "no credible evidence" to suggest that the chemical could reduce the risk of such cancers of the prostate, lung, colon, breast, ovaries or pancreas. The FDA's findings, published in the Journal of the National Cancer Institute, was an especially big blow to pasta-loving men everywhere. The first study to reveal tomatoes' anticancer properties, conducted in 1989, had found that men who consumed one or more weekly servings of tomato sauce reduced their risk of prostate cancer by as much as 60%. Another large 12-year study of more than 47,000 men by Harvard researchers in 2002 found similar effects. Since then, however, other studies have failed to show the same benefits. So, does that mean tomatoes aren't worth eating? Not at all, say researchers. When it comes to prostate cancer in particular, tomatoes may yet offer some health benefits. Many doctors believe that tomato products, and lycopene, don't affect all prostate cancers equally, but may instead help slow the growth only of aggressive and late-stage prostate tumors. "There is some evidence that it's at the later stages of prostate cancer where lycopene might be most relevant," says Dr. Edward Giovannucci, professor of epidemiology and nutrition at the Harvard School of Public Health and principal author of the 2002 study. "But with PSA tests picking up cancers earlier, we may not be able to see that benefit." Indeed, the introduction of the so-called PSA (prostate specific antigen) test in 1998 appears to have had a significant effect on the results of various studies. In early, pre-PSA studies, more men overall ended up developing cancer  since they weren't screened for preliminary signs of the disease, they couldn't be treated early. In these studies, a strong link between lycopene and the reduction of later-stage aggressive tumors emerged. But in post-PSA studies, this association weakened, since fewer men went on to develop the aggressive, advanced form of the disease. "I'm still as enthusiastic about the hypothesis [that tomato products can reduce prostate cancer] as I was five years ago," says Giovannucci. "We just need to figure out a way to do better, more definitive studies to understand how it works." The American Cancer Society agrees, and says tomatoes still have lots of beneficial antioxidant properties. "This wouldn't change our advice to cancer patients, which is to eat a variety of vegetables and fruits everyday," says Marji McCullough, director of nutritional epidemiology at the Society. "We do encourage people to eat tomatoes and tomato products because they may reduce the risk of certain cancers, but we recommend that in the context of a diet rich in a variety of deeply colored vegetables and fruits. Until we know more, it's sensible to include tomatoes in the diet." For now, though, just don't expect to see that advice on your grocery store shelves.